Click on the links to see some of my past! 7) 4th Anniversary Banner- by Nick 8) Rocket Power Party Banners. 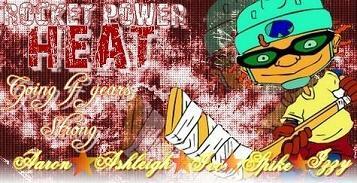 Rocket Power Heat was born on June 8th, 2002. 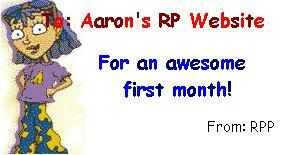 It was then named Aaron's Rocket Power Website, later on Bullrose's Rocket Power Page. 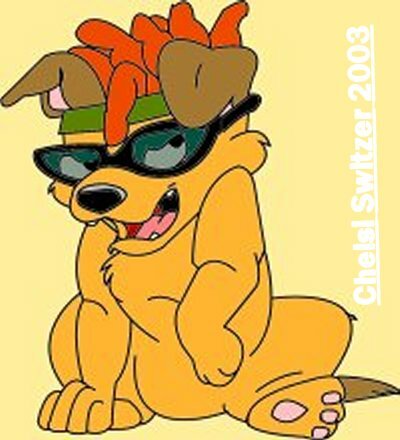 I had encouragement to start my site from Rocket Power Party, which is the first Rocket Power site I have ever seen. It was little known where I started the site. The site was started in a small library on the south side of my hometown, South Bend, IN. I would spend 4-5 hours a day, working on the site, with little progress. I thought of giving it up all together, then. But, I didn't. I had a lot of friends from other various sites, like Dan from Rocket Power East Coast, Ashley from Rocket Power Party, and Chris from Maximum Rocket Power tutor me on how to run a site and how to organize it. I had even started Deathmatches, which were popular fights between characters, up until a couple of years ago kept the fans interests up in the site. It was quite an interesting year, to say the least. I had rechristened the name of my site to Rocket Power Heat around the fall of 2002. What was apparent was the fact that it was growing quickly and I need help. So I thought I could enlist the help of Nick, who also helped with my banner, a couple of years later. However, Ashley had a change of heart with me. She started to say on IMs that she hated my guts with a passion. So, she enlisted Nick to ruin the site under the guise of Donny Jones, a known Rocket Power hater and spammer. I panicked to the point where my life was nearly in ruin. A war between Rocket Power Heat and Rocket Power Party spewed out for months, until she forgave me about the spring of 2003. I had fired Nick for that act of betrayal, but forgave him for that by bringing him back, a year later. What happened to Ashley? No one really knows. I hope she is okay. We were all immature back then. Things we said, but I wish her the best. I do know that Nick still roams around Myspace, but haven't talked to him in ages. In the middle of 2003, Nick introduced me to a girl by the name of Chelsi. Later, I found out her real name is Brittani. She has a knack of drawing great things, even at the young age of 14. It hasn't changed today at all. She is still a great artist, and a great friend of mine, who works occasionally with me to update the site. Things weren't always peachy with Brittani. Part of that had to do with the fact that I fired Nick, back then and wouldn't let him back in. Nick and Brittani were great friends, and it angered her that I treated Nick like that. After that (2004), it had been about two years since I talked to her. We decided it would be good if we patched things up. And it did work, and we became great friends again. In fact, we still are today. We laugh about it from time to time, when I get to IM her. I have to say I am very grateful for her giving me a chance to be her friend again. She has been an amazing asset to Rocket Power Heat, and her artwork proves it. It is some of the best I have ever seen. She is a lot better than some of the animators I see on TV. What is Rocket Power Heat's legacy? 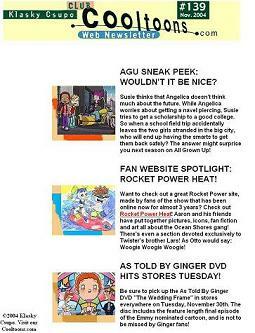 I hope that I have entertained Rocket Power fans far and wide. I have met people all across the globe online. From Mexico, to the Netherlands, to Australia, and back home. I have never realized, until now that I have lived a dream. I am glad I did not quit that hard day, back in 2002, where I thought my site would amount to nothing. Many people would say, that this is more than nothing. This cartoon, this site has inspired the very best out of me and I really enjoyed the ride with other fans. I still meet people online that say they love it. In fact, I hired Amanda recently, who is a big Rocket Power fan. Sure, she may be a little green when it comes to web design. But, the only thing I care about is the fact that she is a true fan of the show. And I hope I represented you well. I thank you for your support and many years to come! Woogie, woogie, woogie!